Frequently Asked Questions Regarding Social Security Benefits Written By Attorney Erin L. Shea, Esq. The name of your bank, account number, and routing number so that any benefits you may receive can be direct deposited into your account. If you have questions about how to make the most your income and preserve assets in the wake of a loved one’s passing, please contact our office to schedule a consultation at 508-994-5200. ©Surprenant & Beneski, P.C. 35 Arnold Street, New Bedford, MA 02740, 336 South Street, Hyannis MA 02601 and 1265 Belmont Street, Suite 2, Brockton, MA 02301. This article is for illustration purposes only. This handout does not constitute legal advice. There is no attorney/client relationship created with Surprenant & Beneski, P.C. by this article. Do Not make decisions based upon information in this handout. Every family is unique and legal advice can only be given after an individual consultation with an elder law attorney. Any decisions made without proper legal advice may cause significant legal and financial problems. Assemble the push pop containers by adding the base and stick, make sure they are set well. Prepare the blue jello according to package directions. Pour the blue jello into push pop containers ⅓ full. Refrigerate until set. Add 2 cups of the heavy whipping cream, 2 teaspoons sugar and lemon zest to a microwave safe bowl. Pour into the cream the gelatin. Heat in the microwave on high for 1 minutes. Stir until the gelatin starts to dissolved. Once the blue layer as set, pour the cream until ⅔ full. Refrigerate or freeze until set. Prepare the red jello according to package directions. 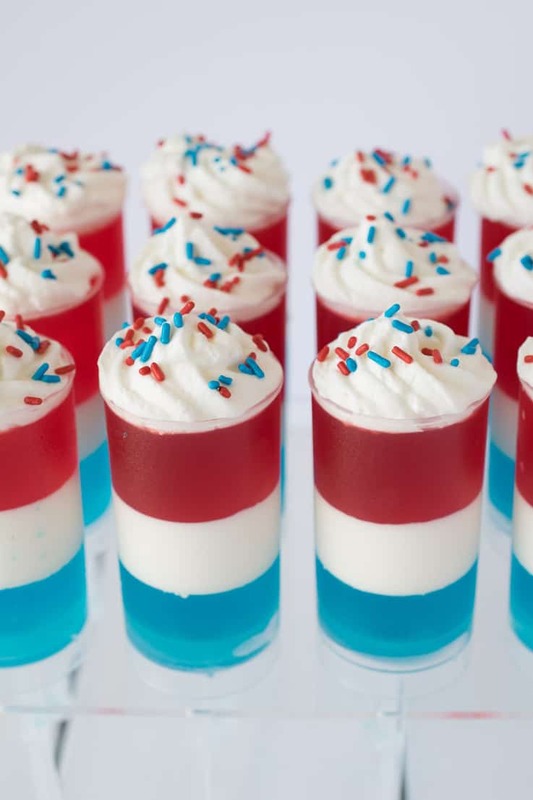 Pour the red jello over the cream until the push pop is full. Refrigerate or freeze until set. Add the remaining cup of whipping cream to a mixing bowl or stand mixer with the remaining teaspoon sugar. Beat on high with a hand mixer or stand mixer until stiff. Pipe or spoon the cream onto the top of the set push pops and decorate with sprinkles. Have you checked your IRA Beneficiaries lately? by Atty. Brandon C. Walecka, Esq., LL.M. A designated percentage to Jimmy Doe’s Trust established as a separate share trust under [Insert Article] entitled "Retirement Plans and Life Insurance Policies" of the Doe Living Trust dated April 1, 2015. A designated percentage to Sally Doe’s Trust established as a separate share trust under [Insert Article] entitled "Retirement Plans and Life Insurance Policies" of the Doe Living Trust dated April 1, 2015. It is important to note that this specific language must be present on the beneficiary form in order for the trust to qualify as a proper beneficiary of the retirement plan account and not cause tax consequences. Unsure what your retirement plan accounts beneficiary designation form says? Give our office a call today at 508-994-5200 and we can review your beneficiary forms. ©Surprenant & Beneski, P.C. 35 Arnold Street, New Bedford, MA 02740, 336 South Street, Hyannis MA 02601 and 1265 Belmont Street, Suite 2, Brockton, MA 02301. This article is for illustration purposes only. This handout does not constitute legal advice. There is no attorney/client relationship created with Surprenant & Beneski, P.C. by this article. DO NOT make decisions based upon information in this handout. Every family is unique and legal advice can only be given after an individual consultation with an elder law attorney. Any decisions made without proper legal advice may cause significant legal and financial problems. Fairhaven’s largest annual family friendly event known as the Homecoming Day Day Fair is set to happen on Saturday, June 27th from 10am-4pm. It is held in the one block radius of Center Street, from William to Green Streets. Enjoy the 175 booths of handmade crafts and delicious foods (my favorite is the Eccles Cake). There is always live entertainment and there will be an art exhibit on the west lawn of the Unitarian Church. For little ones, they can enjoy a ride on the ever popular fire engines! Admission is free. Visit their Facebook page by clicking here! Pre-heat the oven to 400*F. Line a baking tray with parchment paper and set aside. Mix all the filling ingredients together in a small bowl. Set aside. Roll out the pastry on a lightly floured surface to the thickness of 1/8 inch. Cut into 3 1/4 inch rounds with a sharp round cutter. Place 1 teaspoon of the filling into the center of each disc. Lightly brush the edges with beaten egg and bring the edges together into the center, wrapping up the filling and pressing them firmly together. Turn over and flatten the disc ever so slightly between the palms of your hand until it is about 2 inches in diameter. Brush the top with the milk and then sprinkle with the demerara sugar, or dip the tops into it if you find it easier. Place about 2 inches apart on the prepared baking sheet. Re-roll the scraps of pastry and cut until you have used it all up and all of the filling too. Cut several small slits in the top of each with a sharp knife. Bake in the pre-heated oven for 10 to 12 minutes until golden brown. The currants and sugar will caramelize through the holes and they will be scrumptiously delicious. Boil coffee in a 2-qt. saucepan. Whisk in sugar and gelatin until dissolved, 4–5 minutes. Pour into an 8" square baking dish; chill until set, 2½ –3 hours. Cut into 1½" cubes; serve in mugs with whipped cream. There are very few downsides to summers in New England but if I had to come up with just one I would say that the mosquito population is a definite downside. Not only are they annoying and make you itchy but mosquitoes are a serious health hazard. They carry diseases such as West Nile Disease, Eastern Equine Encephalitis (EEE) and Chickungunya, just to name a few. The good news is that if you live in Bristol County, the county proactively sprays to keep the mosquito population down. Spraying began on June 1st . All towns are treated once a week. However, if your particular neighborhood seems to have a particularly bad infestation, you can contact them to spray in your area... for free. For more information on this free spraying service for residents of Bristol County, please click here. When the health of an elderly parent starts to decline, typically one sibling steps in to become the primary caregiver. The demands start out small. Care is easy at first. But as care demands more time and money, stress builds and so can resentment toward non-contributing family members. Old rivalries and jealousies raise their head and get in the way. The fights are typically over money and time, the two elements contributing the most to caregiver stress. So what do you do? If you want help caring for an elderly parent, you need to convince your brothers and sisters of it or find that help outside the family. With that as a background, here are 10 tips to dealing with unhelpful siblings: 1. Accept that there is no such thing as "fairness" when it comes to family care giving. Someone in the family always shoulders a disproportionate amount of the load. Life is like that. Should it be that way? No. But wishing for something different only makes matters worse. 2. Open up the lines of communication with every family member, even those you don't always get along with. Let them decide how much they want to be involved. 3. Have a family meeting to get everyone's viewpoint on elder care needs. What you are seeing may not be what others see. What you think is critical may not be and vice versa. Having other viewpoints can be helpful. 4. Do it now. Waiting only makes matters worse. Don't assume someone else in the family will take charge. 5. Put aside your "shoulds" and focus on the taking care of your elderly parents. It simply doesn't matter what you believe your siblings should do. What does matter is getting the help your aging parent needs, whether it's from your siblings or outside the family. The plain, simple truth is you can't change someone else. Only they can do that. Obsessing about it and "shoulding" on them only makes your life more stressful. None of this is about you anyway. It is about managing the care of an aging parent. 6. List all of the support your parent may need. Be specific: fixing meals, bathing, managing the checkbook, grocery shopping, taking dad to doctor appointments, calls to advisors, picking up medications, checking out caregivers or living facilities, etc. When you need help be exact: "I have a doctor's appointment next Friday and need someone to sit with mom. Could you drop by no later than 9 am for about 2 hours?" 7. Identify and contact help available in the community. You'll need it. Expect to roll up your shirt sleeves, too. It may take a lot of phone calls to find the resources you need. Start with your local Agency on Aging and the senior ministry at your place of worship. If you live in a large city, dial 2-1-1. If you work for a larger corporation, ask your human relations department what elder care resources they offer. 8. Accept whatever help each sibling is able and willing to provide. No one knows how another person thinks or feels or what's going on in their life. One of my clients could not understand why her oldest sister would offer to help, but frequently welched on the promise. Later she learned her sister had enormous health problems of her own but didn't want to burden the rest of the family with it. 9. Your attitude makes all the difference. Sure, it's hard not to be mad when no one else helps. You only hurt yourself, though. Stress is not so much what's happening to you as it is how you respond to it. Focus attention on the positives. Be thankful for those who help if and when they do. Beyond that pay no attention to those who under-serve. 10. Use outside sources to defuse persistent emotional land mines. Consider turning to a professional elder care mediator. The specialty is relatively new but growing. They offer a respectful solution to family conflicts over the care of an aging parent. They offer a pathway to peace and family healing. The bottom line here is to focus only on what you can accomplish for your mom or dad. Resenting siblings for not chipping in makes you feel worse and accomplishes nothing. If it is not in your sister's heart to help, you can't put it there. Accept the help you get. Do what you know you can do and find outside help for the rest. With the right information, you can reduce caregiver stress, keep your life in balance, save money and get better care for your elderly parents. ©Surprenant & Beneski, P.C. 35 Arnold Street, New Bedford, MA 02740, 336 South Street, Hyannis MA 02601 and 1265 Belmont Street, Suite 2, Brockton, MA 02301. This article is for illustration purposes only. This handout does not constitute legal advice. There is no attorney/client relationship created with Surprenant & Beneski, P.C. by this article. DO NOT make decisions based upon information in this handout. Every family is unique and legal advice can only be given after an individual consultation with an elder law attorney. Any decisions made without proper legal advice may cause significant legal and financial problems. 2. Cover a baking sheet with foil and lightly spray with non-cooking spray. Place mushrooms, gill side up, on baking sheet. 3. In a small skillet, add the spinach with 1/2 cup water and cover. Cook on medium-high heat until spinach has wilted. Drain well and squeeze to remove any excess water. Set aside. 4. Combine the ricotta and Parmesan cheeses in a medium sized bowl. Add the bell pepper, onion, garlic and spinach. Combine well. If you opted for the bacon, add it to the cheese mixture and combine. 5. Stuff mushrooms with cheese mixture and bake for approximately 25 minutes. Most kids don't like bugs but make the exception for butterflies. Tucked away in Tiverton, R.I., I happened to come across a zoo of butterflies called "The Newport Butterfly Zoo". It reminds me of the butterfly exhibit at the Bronx Zoo, which is always a big hit with kids and adults alike. The Newport Butterfly Zoo is home to butterflies from New Guinea, Costa Rica and Borneo as well as many North American species. It is stunning to see them all delicately soar across the enclosure. The butterflies range from White Monarchs to Buckeyes and Swallowtails. Even the outside enclosure is also visited by other larger flying creatures such as hawks or wild turkeys. The tropical butterflies flit from flower to flower on sunny days but are stationary on cloudy day, so plan accordingly. Obviously, it is closed on rainy days and is open until Labor Day. It is located on 400 Bulgarmarsh Road in Tiverton, RI. Admission for kids aged 12 and younger is $7.00 and adults is normally $11.00. Call before going is wise, at 401-849-9519. Be sure to like them on Facebook by clicking here!